If you’re taking your truck off-road, you may want to consider a winch as part of your recovery equipment. Without a winch, if you or someone you’re traveling with gets stuck, you might spend your afternoon digging your rig out with a shovel, which is not our idea of a good time. There are a variety of winches, from smaller ATV styles to heavy-duty truck winches. There are also a few different ways to mount them. Here are some important facts to know about winches and how they work. The first thing is to understand how a winch works. Essentially, the parts of a winch and their function are the same regardless of their type or size. The power comes from the motor. It could be electric and draw power from your battery, or in some cases an auxiliary battery. Or it could be hydraulic, and draw power from your power steering system. The power center of the winch, much like your truck transmission, takes power from the truck’s motor and transmits it to the drum. The motor turns the drum, which controls the cable moving in and out. Usually made of braided steel, it does the actual pulling. Some off-road enthusiasts are switching to synthetic fiber rope, a lighter option that does less damage if it breaks. The cable’s passage out of the winch can be one of two types: roller or Hawes. The Hawes is simply an oval opening that guides the cable back in. The roller type has rollers to help guide the cable. When the motor isn’t running, this stops the drum from spinning. Operates the direction of the winch (forward or backward). Run your winch from a safe distance using this device. Together these things make up your winch, no matter how heavy or light duty it might be. There are basically two types of winch cables: steel and synthetic fiber. Steel is usually aircraft-grade and is very strong in general. Although it’s sturdy, it comes with a cost: weight. While steel is the best on rough terrain like mud, rocks, and trees, steel can rust or kink which can compromise its strength. Steel can also form burrs over time, causing you to need gloves to operate it. When a cable kinks, it’s hard to wind back up on the spool, and that often creates a weak spot which can cause it to snap. When a steel cable snaps, it’s potentially disastrous. Synthetic fiber is becoming more popular for several reasons. Its lower weight and flexibility make it much easier to handle than steel cable, and it floats, so water rescues or rescues from a mud hole are much easier. Although it won’t kink like steel cable, careless use can produce knots. Another benefit of synthetic fiber is it has higher break strength than steel cable and can be repaired in the field with good braiding techniques. However, it’s susceptible to UV damage and chemicals in a way that steel is not, and can also be weakened by heat. For this reason, synthetic fiber cables often come with a protective sleeve, protective coating, or both. Synthetic also needs to be maintained, as sand and dirt can harm it, causing it to be more brittle. Really, if either one is in good shape, they’ll both work well. But for many, the lower danger of damage with synthetic cables is more desirable and in many competitions, required over steel cables. When it comes to truck winch styles, there are two common types. Both have their advantages and disadvantages, but both work extremely well. The electric winch is probably the most common. This type attaches to your battery through cables and operates an electric motor. It’s a good method because as long as you have battery power and your vehicle will run, you have a winch at your disposal. With long cables, you can easily relocate your winch or transfer it to another vehicle (as long as it has the right battery connections). More on that when we talk about mounting. The second type of winch is hydraulic powered and taps into one of the most powerful systems on your truck, your power steering pump. The winch moves in and out with hydraulic power instead of electricity. This type is very reliable and becoming more common with off-roaders. The big drawback to hydraulic is that once it’s mounted, it’s not going anywhere. This isn’t always a bad thing, but it does offer some limitations. Line pull is the weight capacity of the winch, or how much it can pull. It’s determined by a number of things, including the motor strength, cable strength, and gear train. The general rule is you need line pull at least 1.5-times your vehicle’s gross weight for your winch to be effective. While there’s nothing wrong with too much power, not enough can leave you stranded. For instance, if you have a 2016 GMC Sierra with four-wheel drive, the club cab, and the six-cylinder engine, your vehicle weighs 5,200 pounds, not including any cargo or passengers. This means the minimum rating for the winch you need is 7,800 pounds. However, by the time you count passengers and cargo, it would be much wiser to have a winch rated for even more weight. At the same time, the more powerful the winch, the heavier it is and the more challenging it is to mount. Plus, you should also consider who accompanies you when you go off-road. What vehicle do they drive and would your winch be sufficient to free them if they should get stuck? 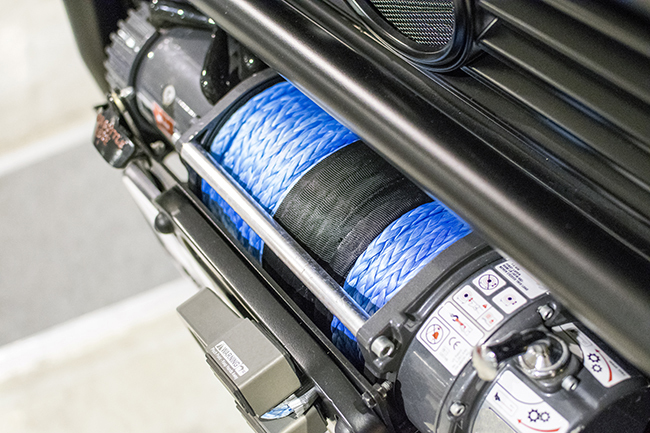 While 1.5 is the minimum multiplier for your winch line pull, you may want more. Winch and cable failure can be catastrophic, so be sure you have enough capacity to get the job done if you need it. There are two types of cables: braided steel and synthetic. The thickness will be determined by your winch capacity and line pull. Braided steel cable is the strongest, most resistant to wear, and easy to replace when it becomes worn. The disadvantage of steel is its weight. The more cable you have, the more weight it adds to your front end. If it breaks, it whips around and can be quite dangerous. It can also develop large metal splinters that are also dangerous. Synthetic cables are gaining popularity because of their light weight. However, they require a more skilled approach when it comes to pulls because they’re more susceptible to breakage. When they break, they won’t whip around dangerously, and splinters are rare. While less common, these cables are a great choice for many off-roaders. Generally, 90-100’ of cable is a good length to choose. In dense woods where there are a lot of solid anchors like stumps and boulders, a 60-80’ length is better. In open areas like the desert, you may want a longer cable, around 150’. In most cases, having a spare cable along is a good idea just in case. The gear systems determine your speed. A worm gear is slower and good for longer pulls. It uses fewer moving parts, so it’s often simpler to maintain and repair. A planetary gear is faster, but generates more heat, and your winch may even overheat on a long pull as it tries to pull faster than you’d like. Both gear types have their place, and you’ll have to decide whether you’re willing to sacrifice speed for less heat. When we talk about winch capacity, we also need to talk about how and where the winch is mounted. Your mounting options are: front-mount, rear-mount or mount it in the middle of your truck in the bed. If you choose a hydraulic winch, your mounting locations are limited, but the most popular one is either on the front bumper or a front mount position. While you can mount it elsewhere, it means running longer hydraulic lines. If damaged, the lines will interfere with your power steering system, which is never a great prospect when you’re off road. The winch needs to mount solidly to your vehicle in a way that allows it to hold and pull thousands of pounds. Here are some location examples. When you mount to the front of the vehicle frame, it allows easy access to the winch while also guarding the front of your vehicle. It looks nice, is rugged, and is a popular choice. Also common, this type of mount consists of a cradle that connects to your Class III (or above) hitch. Be sure you have a strong locking hitch pin. Many off-roaders also install a receiver on the front of their vehicle, so the winch can move from front to rear and from vehicle to vehicle. Mounted behind or under your stock bumper and run through a simple fairlead in the bumper itself. This looks good and won’t impact the look of your truck. As an integrated unit, this offers a clean look and makes for a great looking mount. This bumper is often stronger than your stock bumper. However you choose to mount your winch, be sure to understand the capacity of the mount and the mounting location before you make your final decision. Good luck out there and happy trails! Need tires? We have a great selection at TireBuyer plus fast and free delivery to a local installer. Shop for tires now or if you need help selecting the right tire, give our tire and wheel experts a call at (866) 961-8668.